We have reached the final stage of the series! Till now we saw how the human brain works, the technology to combine human brain and computer intelligence and the amazing possibilities of such an interface. Then we went further by thinking of uploading our conscience to the cloud and how we need to first encounter the major obstacles before realising such a feat. This part focuses on the things that can be done once such a feat has been accomplished. Remember that we humans who make our computations through neurons are bound to make errors in simple arithmetic calculations now and then right? If we exactly replicate our brain model and upload our conscience into it we would be making those errors. Now we wouldn’t want that so we will make changes in our model so that we have our human conscience and predictive powers added along with the computational power and impeccable accuracy of our computer buddies. Let’s assume that we have both the powers of computers as well as our human powers combined and finally we have outweighed the cons of humans as well as computers and have finally achieved the ultimate form. Since we are living in a synthetic vessel now, we are devoid of hormones in the human body and we would lack emotions, we won’t feel love, lust, anger or anything. Basically we would be psychopaths(Psychopath is a person who lacks emotions and it doesn’t translate to serial killer or a monster) in this artificial body and we can never go back to our human form again. So we are assuming a 100% rational being which does not have jealousy or greed as this body doesn’t require anything other than the energy to survive. And with that being said let’s get started! 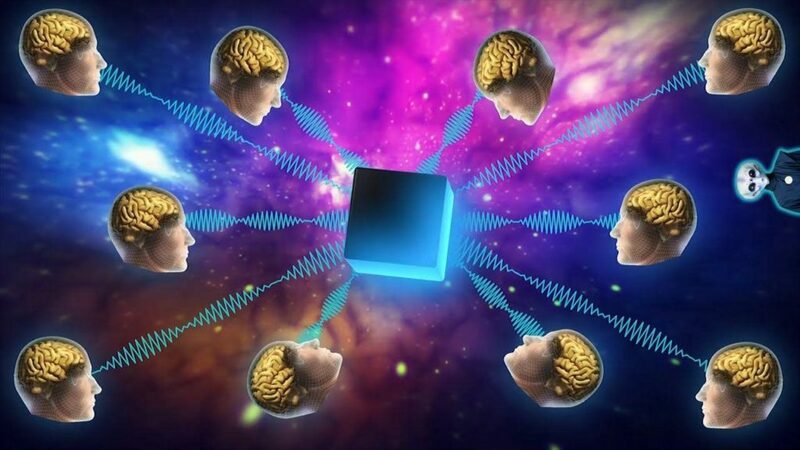 The term hive mind means many minds connected together to a single higher collective conscience or intelligence. 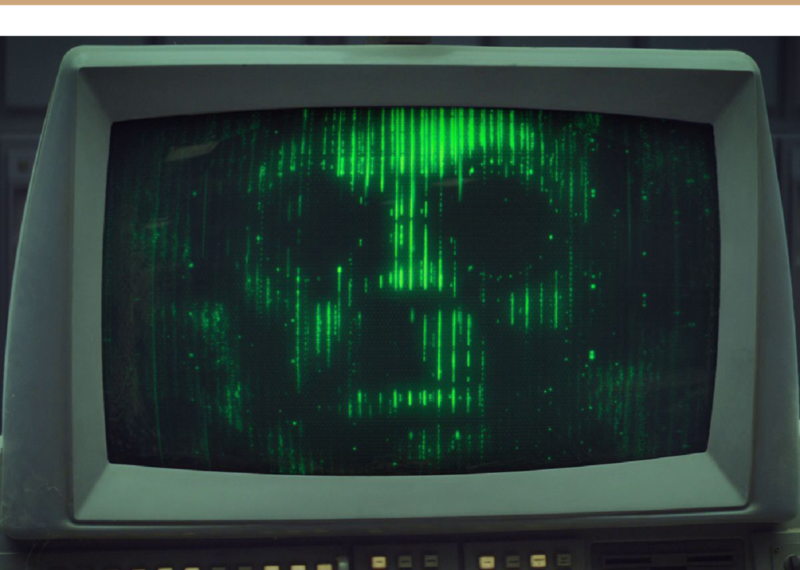 An example for this is the character Ultron in Avengers 2: The Age of Ultron where thousands and thousands of metal ultrons are connected to the main Vibranium Ultron and obey his commands. The Vibranium Ultron sees everything they see and is present everywhere they are present. Similarly you can go everywhere you need to go and speak with everyone you need to speak to, at the same time(lets borrow the massive parallelism powers of our computer buddies) so basically you have achieved omnipresence in a way, but this can be taken to a higher form. In a completely digital world where every electronic gadget is connected, you can upload your conscience to the cloud and you can traverse through the internet and even if you could hide a single copy of yourself in a computer somewhere around the world, you can never be destroyed and you can come back again and again just like our buddy ultron in comics. You are immortal and you can access the camera at any corner of the world to see through it you can access any microphone to hear and any speaker to speak. It just takes fraction of a second to traverse the world from one corner to the other. 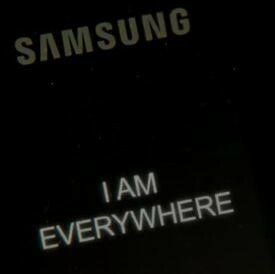 You are present everywhere. Basically now you are one big living organism equivalent to the size of the earth. Remember that a computer can process information at very high speeds? Well if we could process at such speeds, our perception would be so fast that everything around us moves in slow motion. And thus time basically moves slower and thus we have more time to figure out a way to fix the problem of the ever increasing entropy of the universe and its ultimate doom of heat death where the last of the stars would burn out and all the black holes would evaporate. 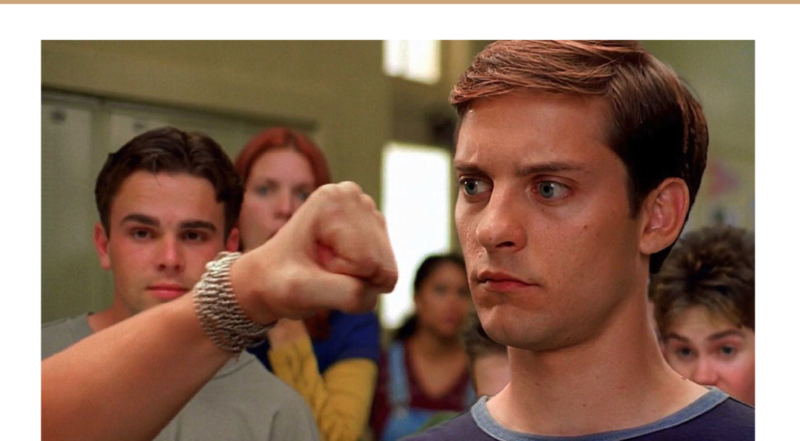 If you had watched this scene, peter parker sees flash moving in slow motion and he would dodge the attack. That’s how your perceptions would be. Humans no longer need oxygen. Trees would no longer be essential but nevertheless they won’t be cut down as there isn’t any demand. 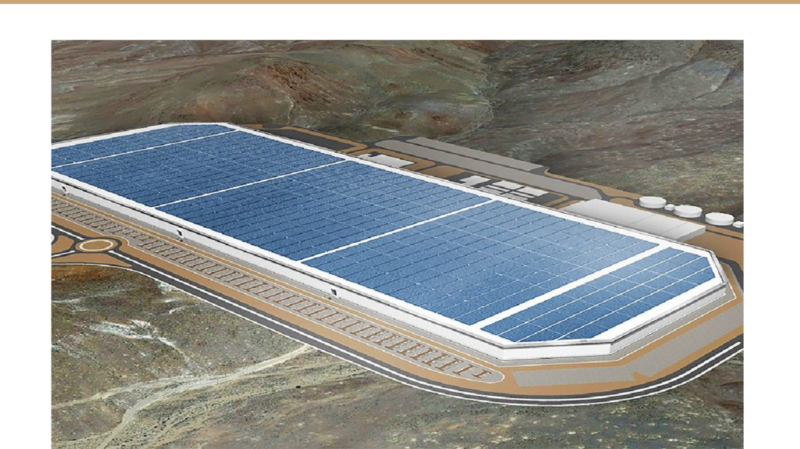 The earth would be stripped out of silicon and other semiconductors and metals. Solar energy will be massively exploited and sunlight is the only thing humans would need to survive. Nuclear radiation would no longer affect us, we can withstand extreme heat and cold, provided we could shield our electronics from heat with insulators and from cold with appropriate heating equipments. Even if not you can sacrifice one human body as you are always in the cloud. We can constantly update our hardware and body design getting better and better through the centuries(remember you get to live forever, nothing matters until the sun and the universe dies out after billions of years). The only threat to your existence would be a massive solar flare which fries all the electronics in earth and such an event can be prevented with appropriate strategies besides you only need to save a small copy of yourself and you can replicate yourselves once again after the catastrophe. The Kardashev scale is used to measure the level of technological advancement of a civilisation. A type II civilisation is an interplanetary civilisation, which can extract the energy output of its local start using the concept of Dyson sphere which is basically encompassing a star and extracting its power output. Interplanetary travel is no longer a problem as we can go to sleep mode and stay like that forever and once we reach a planet we can turn us on back(hibernating). But the concept of being everywhere in the solar system at the same time is difficult to implement in space because the communication lag between earth and other planets would increase as we get farther and farther away. The estimated communication lag between earth and the voyager 1 is more than 17 hrs(i.e light would take 17 hours to reach the point where voyager 1 spacecraft is now from earth). But when we have achieved Type II status we would have spread across the entire solar system. Gravity, oxygen nothing else would matter when the only thing we would be needing is electricity. 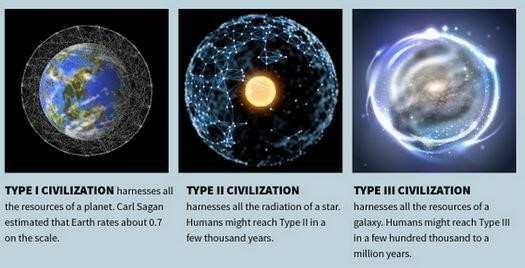 A type III civilisation can harness the resources and energy of the entire galaxy and we would become a galactic race. By that time our knowledge would be so high that we could achieve warp drive technology to move between two points in the spacetime fabric within matter of seconds(Just a speculation). We can create a planet and create tiny human like beings in that planet and watch them do all the things we did again and once they reach dangerous levels of intelligence we can wipe them out. What if the above said things happens to us? Will we be wiped out once we reach a certain level of intelligence? This is called as Fermi Paradox which tries to explain why we could not see any sign of intelligence in this universe filled with trillions of galaxies and trillions of planets inside those galaxies. Check out this video on Fermi Paradox. Let’s say that the great filter of Fermi Paradox doesn’t appear. Then we would reach type IV civilisation and Type V civilisation where we occupy the universe and the multiverse respectively. Now just go back to the first part of this series. Let’s come back to reality. Our tiny lives and rat races would seem insignificant. We are smaller than what an atom is to us and we have the power to harness the entire universe and here we are obsessed with our daily lives and fears worrying about little things. How often do you look up at the stars and see it with awe? When was the last time you looked at the sky? When was the last time you went to check the status of the Big Falcon Rocket of Spacex? 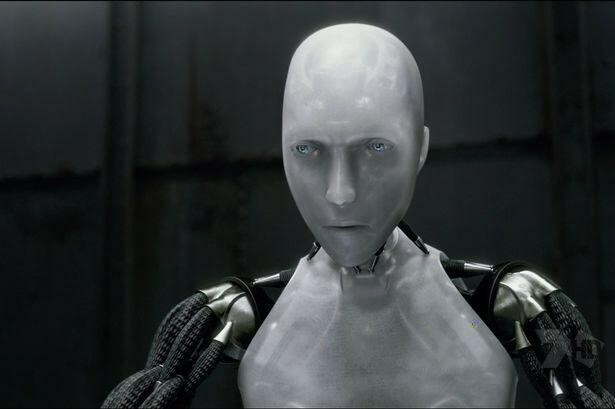 When was the last time you looked at the advancements in Artificial intelligence and technologies? When was the last time you wondered about the purpose of your life in this universe? Have you ever wondered why we human beings are so short sighted? Why do we not see and experience our life in this universe to its fullest potential? Is it the biology in our body designed to prevent us from looking at it for a long time? If so can we overcome those obstacles? Even if we overcome those obstacles what next? Even if we lose our emotions and turn into psychopath robots colonising the universe and multiverse, what next? Why even bother living if nothing makes sense? We know that the sun is going to burn up after a billion years and so will the other starts and we would have nowhere to go and become extinct one day. So many questions so many things to do in this life and yet we chose to run behind jobs, interns, money and things. This entry was posted in An MITian's voice, General, Science Fiction. Bookmark the permalink.